If you are looking for a pleasant family-oriented blueberry and wild blackberry picking experience, or a jar of pure honey, you are at the right place. Look around, let us know if you have any questions, and come pay us a visit. We are now closed for the berry picking season. A big THANK YOU to all who came out to support us and pick our blueberries and wild blackberries. We made many more new friends this year and that is what we like the most! See you all next season; mark your calendars for early June! We are also sold out of honey. 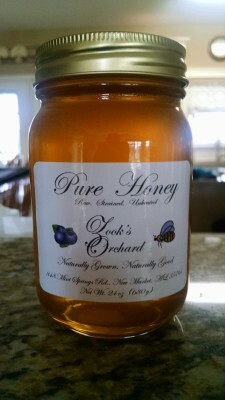 We sold out of almost 200 lbs of honey in 1 week! Our next honey harvest will be in early June to coincide with the start of blueberry picking season. Mark your calendars NOW! Project Wild Blackberry Expansion continues! Pure raw honey, you-pick blueberries, and you-pick wild blackberries, when in season and available.